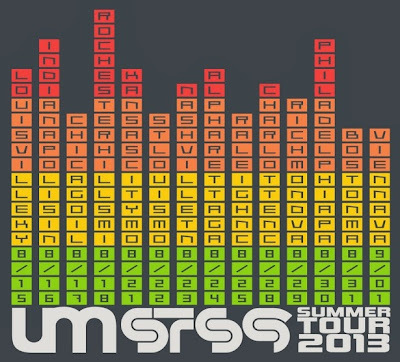 Sound Tribe Sector 9, more commonly known as STS9, and Umphrey’s McGee teamed up for a 2013 summer tour which the bands have said is “for your mind-expanding musical enjoyment” and, in my opinion, is surely something not to be missed. For those unfamiliar, STS9 is an instrumental jam band which described their own tunes as “post rock-dance music.” The band formed in 1998 near Atlanta and consists of members: Hunter Brown on guitar and midi keyboard; Jefree Lerner holding down percussion and handsonic; David Murphy playing the bass and midi keyboard; David Phipps on keyboard; and finally, Zach Velmer on drums. Umphrey’s McGee was formed in South Bend, Indiana in 1997 – eventually relocating to Chicago - and could be described as a progressive rock jam band. According to their website, “fans who have followed Umphrey’s McGee for any period of time know that there are only two guarantees: you never know what you’re going to get, and Umphrey’s always delivers.” Umphrey’s consists of: Brendan Bayliss on guitar and vocals; Jake Cinninger also on guitar and vocals; Joel Cummins on Keyboard, piano, and vocals; Andy Farag on percussion; Kris Myers on drums and vocals; and Ryan Stasik on bass, but no vocals. I was lucky enough to attend the third show of this co-headlining tour in Chicago, Illinois at the FirstMerit Bank Pavilion, formerly known as the Charter One Pavilion, on Northerly Island. Having never been there before I was surely in for a treat while seeing two of my favorite bands. Rather than drive to the show, I took the Metra from North suburbia into the city early on Saturday afternoon with some friends. We walked a short distance, hopped on the red line of the Chicago subway system known as the L, and got off at the Roosevelt station only to walk about 20 minutes through the museum campus before making our way over to Northerly Island. My ticket needed to be picked up at will call and boy that was not as easy as it sounds. The box office at the FirstMerit Bank Pavilion is right outside the main gates, which is nice, however, they only had the far left 3 windows labeled as will call and the other 4 windows had no labeling at all. This caused everyone with will call tickets to flood those 3 windows and created some gigantic lines.. Screw that. I went over to the other line, which had virtually no wait, only to find out they were all will-call lines and that the other line was a giant waste of time. Eventually I got my ticket and everything was good to go – I feel bad for the people that didn’t try the other line. Security at the gate was very lenient, only really checking for weapons and liquids in camelback bags. At this particular show, I’m not sure if this is a regular thing for this venue since it was my first time there, they did not have any water fill stations or water fountains to refill your hydration backpacks for free. Without a station to refill my water I was relegated to purchase two $7.50 bottles of SmartWater, minus the bottle caps, to fill my bag throughout the night. Once the water situation was addressed, I made my way into the crowd because STS9 was about to come on. The venue this night was smaller than I had expected from an outdoor venue, however, after speaking with several people I came to learn they constructed an artificial VIP club tower behind the GA floor which blocked off a grass lawn – which, from what I heard, is rather large. The stage was positioned facing South-East towards Lake Michigan which allowed for an incredible backdrop of the Chicago skyline throughout the concert. STS9 took the stage right before sunset and immediately came out with a bang. Although a laser show was ineffective with the sunlight, their giant light-board pyramid was paired with a laser show that became more and more breathtaking as the sun settled behind the city’s skyline. The band’s transitions were flawless and their sound was magnificent. This was my third STS9 show this year - my second this week - and they were more on top of their game that night than any other time I’ve seen them. They came out swinging with “This, Us” and soon transitioned through “Squares & Cubes” right into my personal favorite song by them, “Golden Gate.” Sound Tribe played a lengthy set, 14 songs in all, but unfortunately ended without an encore; however, I wasn’t all too distraught or surprised because of their opening act status for the night. Their entire set from the show is available for download on 1320 Records’ website: HERE. When STS9’s set ended, flood lights came on and illuminated the crowd and stage at the pavilion for crew to come and prepare the stage for the headliner, Umphrey’s McGee. After about 30 minutes the stage was ready and the lights began to dim which sent the crowd in a frenzy of cheering and clapping in anticipation of the band taking the stage. They came on and thanked the crowd for being there tonight and told us how excited they were to be back in Chicago. After minimal banter, they went right into “Le Blitz” and transitioned into “Bridgeless” only to sandwich “Dear Lord” between “Plunger.” The band played an electrifying set and ended with what they started, “Bridgeless.” After finishing their set, they left the stage for a bit but returned for a much anticipated encore. They tactfully played through their first song of the encore and then paused to announce that all the members of STS9 would be joining them on stage for the final song of the night. I couldn’t believe my sense; STS9 and Umphrey’s McGee on the same stage, at the same time – I was in heaven. Together they played a rendition of “Let’s Dance” by David Bowie which was strongly influenced by their jam style of music. This was easily the most memorable moment of the night because of the pure joy you could see on the faces of all the members of both bands. They were having the time of their lives and that energy transpired onto the crowd creating an extremely intimate and energetic atmosphere. I could not have asked for a better ending to an already amazing concert. The entirety of Umphrey’s set can be found on umlive.net: HERE. The show ended at 11 because it is an outdoor venue within the city limits, however, Umphrey’s McGee played a late night show after the concert at the House of Blues. Despite my excitement for it and my desire to attend, I could not be there because I needed to catch the last train at 12:25 AM back to the Northern suburbs. After the show ended we walked for about 20 minutes across the museum campus through which we came before the show and eventually caught a cab for the rest of the trek back to Union Station. Once we were on the train and started talking about the show, it really hit me how incredible the night truly was. The music was on key and crisp all night and the lighting effects were spectacularly engineered. 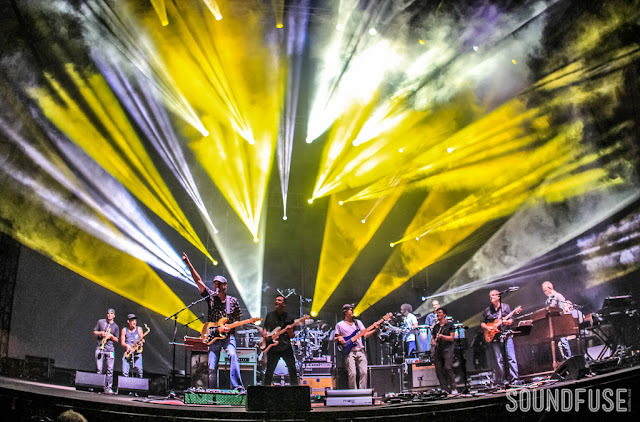 STS9 and Umphrey’s McGee are two the most prominent jam bands currently touring and you now have the opportunity to see them at the same time. I would not miss this tour if they come to a city near you. Both bands played one of the best sets I have heard them string together. If you were unable to make the show, I highly recommend you download the sets and give them a listen because you seriously don’t know what you missed out on. Kudos to both bands and all production staff involved for putting together a show that I will surely never forget. Until next time my friends, until next time.